Space heaters have always struck me as inherently — how shall I put it? — low-echelon devices. They seem best suited to college dorm rooms, along with Simpsons VHS tapes and a Costco-sized box of ramen noodles. Relying on one is maybe one small step above warming your cold-water flat with the gas oven. In other words, the thought of a “Cadillac of space heaters” seems a bit of an oxymoron. But the Dyson of space heaters? Having tackled vacuum cleaners, hand dryers and artificial summer breezes, Dyson is once again taking a mundane home appliance to task. 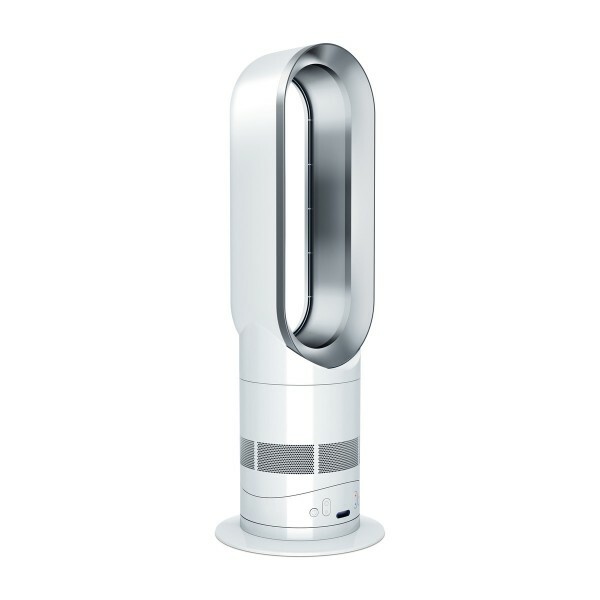 Meet the Dyson Hot. It is, of course, a thing of beauty. Like Dyson’s Air Multiplier fan and its Stick mini-vac, the Hot is something you wouldn’t mind leaving out to impress your party guests. It costs $400, so there is the hint that part of what you are buying is cachet — even if company founder and product designer Sir James Dyson insists that what he’s selling is the technology, not the cool factor. Space heaters aim to be economical. You pay only for the power needed to keep a small space comfy, as opposed to paying to “heat the entire house,” as my father used to say when I turned up the thermostat. They are the descendants of the fireplace (and the fire pit, if you want to go back that far), though these days we are less likely to gather around heaters than we are the screens in our living rooms. I’ve owned several space heaters, mostly to keep pets warm in the hide-aways where they like to hole up. They are expected to heat up quickly, maintain a steady temperature, operate with a reasonable level of power efficiency and, above all, be safe. Heaters that use fossil fuels are non-starters (no pun intended) but even most electric-coil models don’t instill enough confidence that you’d feel comfortable leaving them unattended. None of these concerns exist with the Dyson Hot. It heats up quickly and runs quietly compared to the other forced-air space heaters I’ve owned. You’d have no qualms leaving it in a room with pets or children. The heating plates are fully enclosed — they run vertically along the flattened sides of the oval. It’s tough to knock it over, since it’s bottom-heavy. But, like most space heaters if it does fall over, it shuts off. And — it oscillates! And tilts forward and back! Which means the whole room will get heat, not just the narrow area at which it’s pointed. It’s still remarkably efficient even without the oscillation in smaller rooms. In an overnight test with the oscillator off, it kept an 8-by-10 room warm despite an open window (about 50 degrees Fahrenheit outside). A couple other small usability features worth noting: The remote is the familiar, slightly arched variety that ships with Dyson’s air multiplier fans. This one, however, can be attached to the unit by a magnet at the very top. Dyson also claims the Hot doesn’t stink up your abode with a burning smell. I didn’t use the review unit long enough to determine if this was true or not, but since the heating elements are vertical and encased, the chance it would collect dust does seem minimal. As usual, there’s really nothing to complain about with a Dyson product — except the price. There are plenty of options priced at one tenth the cost. And even though the Dyson Hot doubles as a cool air fan in the summer months, the “total cost of ownership” argument is still a stretch. Dyson is free to charge whatever the market will bear, of course, which is usually a hefty premium above both the “good enough” alternatives and the luxe competitors. Because you’re paying a premium for the design, the company is often compared to Apple, an association which quickly becomes tiring. But there it is. And it’s hard to argue with success. Vive le capitalisme! WIRED Compact and stylish. Safety features are comforting. Doubles as a cool air fan in the warmer months. Remote’s design is the best use of a magnet since the iPad 2’s Smart Cover. TIRED I’ve said it before, and I’ll say it again: Price. 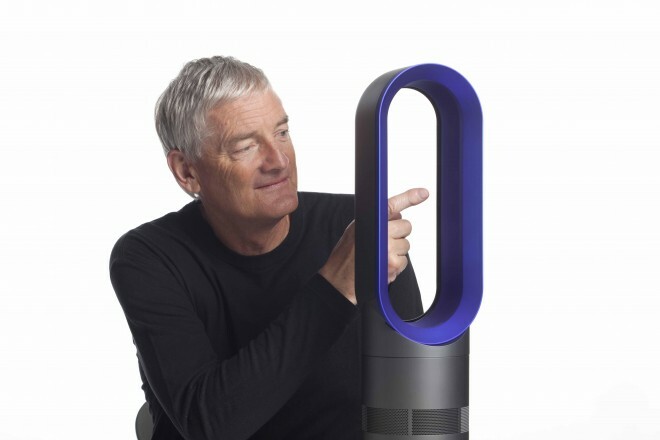 Company CEO James Dyson indicates the Dyson Hot's general position in space and time.